The Chinese know something about staying slim. It is highly unusual to find anyone who is overly fat in this culture. The food and health practices based on natural herbal compounds are known to be responsible for the (generally) good health and longevity. Taking from that proven heritage, and With its natural ingredients, the components of Super Slimming capsules have been scientifically shown to help lose weight fast. 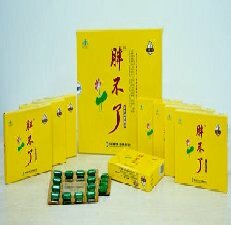 Containing 100% PURE herbal plant extracts, and traditional secret formula, this product helps to lose weight quickly and safely. It accelerated fat metabolism and eliminated fat accumulation. It is know to also delay skin aging. Best of all, you don't have to change too much of your favorite food except they are unhealthy food. It has not known side effects. It can be helpful to people with metabolic abnormalities. 8 packa of 12 capsules/Pack. One pack of 12 capsules. Helps lose weight fast and safely. Accelerates fat burning and prevents fat accululation.